Rain! 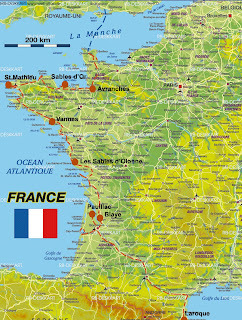 Normandy, and later in the day Brittany, are rather different from good old Languedoc-Roussillon. Wetter but greener, crops rather than vineyards, a cuisine based on cream and butter not olive oil. Pleased we had taken photos of the hotel garden the evening before, we scurry damply through it from our modern annex to the original building. The copper and brass collection there is extraordinary; top photo is of the pot I most coveted. All our breakfasts were hotel buffets: baguettes, croissants, jams, juices, cheeses, cold meants, butter (in our previous experience of France, le petit déjeuner was the only meal when butter was served with bread, but in Normandy/Brittany, it appears at dinner as well). The orange juice here wasn't the greatest, but the dispenser was—an elegant tall glass cylinder with a central column filled with ice. Grabbing hooded jackets and an umbrella, we set off to see a few of the sights in Avranches. Since we only had an hour or so before we needed to get on the road, we couldn't really do justice to the town. We didn't make it to the castle or the scriptorial museum or the episcopal palace, but did pass this lovely residence on our way to the famous botanical gardens. Still, the garden was lovely, even in the rain, as we strolled where Guy de Maupassant and Victor Hugo had found inspiration. Our guidebook mentioned an inscribed paving stone, but the first girl we asked at the tourist center had never heard of this memorial (Michael was the one talking, so the problem wasn't the phrasing of the question). Her senior colleague, however, knew straight off what we were looking for, and we were directed to a remote corner of town where a cathedral had stood until 1794, when it was destroyed during the French Revolution. At first , sand-obsessed as always, we thought the engraving on the stone was an hourglass, but on closer look the geometry meant it had to be a chalice. The plaque on the pillar (apparently from the cathedral) read "La penitence d'un roi," so we had clearly come to the place where, barefoot, bareheaded, and on his knees, Henry repented of his crime. At the tourist center, escaping from the deluge outside, I had also picked up a brochure for Marie-Louise de Bouteville: Epicerie Fine Régionale et Internationale. Since we had to pass that way returning to the hotel, Michael indulged me. A visit to what was also billed as a "Purveyor of Fine Foods & Spirits" never goes amiss and this turned out to be well worth the stop. Not only were the purple potato chips and crispy apple caramel cookies we bought delicious, the owner was a treat. Not Marie-Louise—she was his aunt, who had died a few years ago at 103, sharp right until the end. On her 100th birthday, feeling very chipper, she'd announced to her relatives, "Sorry—you're going to have to put up with me a while longer." Her nephew was about our age, spoke very good English (though in his youth he'd lost a job with Gerber in London for lack of proficiency), and, despite his sophistication, was obviously completely unconcerned with appearance, since his frequent broad smiles disclosed that he was missing his bottom two front teeth. When he heard I was from the Philadelphia area, he said, "Next time bring me a cheesesteak. I love Philly cheesesteak!" This unexpectedly long conversation, during which we learned there are 200,000 American expats in France, meant we needed to check out quickly and get on our way to Mont-St-Michel, first glimpsed across the polders, which Michael explained was a Dutch word for a stretch of low-lying land reclaimed from the sea. The second photo below shows a few of the sheep that graze on the polders; their meat, known as l'agneau pré salé (salt meadow lamb) is prized for its unique flavor. A couple more photos as we neared the extraordinary Disney-like structure that had been erected over centuries on granite rock once cut off from the mainland but now connected via a causeway. We didn't have time to explore the abbey—just as we didn't visit the skull of its founder, St Aubert, in St-Gervais Church in Avranches. The hole in the skull is supposedly where the archangel Michael poked Aubert with his fiery finger when the latter delayed in getting on with the project; the truth is it's probably a trepanned skull belonging to someone else entirely. For more detail on this Unesco World Heritage site, the biggest tourist attraction in France outside Paris, see Michael's blog post, Mont-St-Michel: a massive sedimentology experiment. We'd been lucky to gaze at Mont-St-Michel moistly rather than wetly, but the rain started up again as we drove past the painstakingly researched engineering work for the bridge that will replace the causeway in 2012. Our goal was the rugged coast of the Côte d'Emeraude, looking more gray than emerald this day. We drove through several fishing villages (with Michael leaping out to collect wet sand) and then arrived at the beach town of Sables d'Or, looking for somewhere to stay a little more promising than the Hôtel et Restaurant Beauséjour in Erquy. We had only booked accommodation for our first night and Michael's birthday, figuring we'd try the relaxed approach of Laurie and Libby. This was the one time that more spontaneous way of doing things almost didn't work. Beauséjour was in the 2009 Michelin guide we were using, but that doesn't show the * to ***** system of French hotel rankings. As a result of the offputting shabbiness of Beauséjour's reception area, a new rule: never drop below ***. Turned away by the first Sables d'Or hotel we tried, we ended up at Hôtel LaVoile d'Or (from a gold cross the night before to a gold sail), rather more expensive than what we had hoped, but by this time we were both wet and tired. The sky cleared, though, and Michael went out for a bit more sand collecting. Dinner was very upmarket, with formal service and a chef with a fetish for multiple plates at each course. As seems to happen with surprising frequency these days, the best dish was the pork Michael ordered; this has been true in London and California as well. It would seem that the culinary world is paying more attention to the humble pig. We learned another phrase when the waitress amended Michael's "Ça marche" on sampling the 2oo6 Sablet to "Ça roule!" Below is the dessert spread, mine variations on an apple theme, Michael's chocolate. The photo at the bottom is of the tray wheeled to the table when Michael had his coffee.